Originally scheduled to appear in Louisville, Senator Bernie Sanders delivered a live broadcast from Washington, D.C. while awaiting the vote on the Republican Tax Cuts and Jobs Act Dec. 1. Kentucky Congressman John Yarmuth and Ohio State Senator Nina Turner were also featured speakers. Totaling at nearly 500 pages, the bill was passed in the senate early Saturday with a vote of 51-49. The $5 trillion bill will give tax cuts to the wealthiest corporations in the country at the expense of the middle class. “This tax bill, which the senate is about to vote on in a little bit, is one of those, I think, Litmus tests about people’s values,” Yarmuth said. Yarmuth said the notion that the proposed tax cuts would lead the wealthiest one percent to create more jobs is nonsense. He said as a member of the one percent, he doesn’t want the tax break if it’s going to be paid for by the working class. “They’re proposing to give a one and a half trillion dollar tax cut to American corporations and they’re borrowing to do it,” he said. 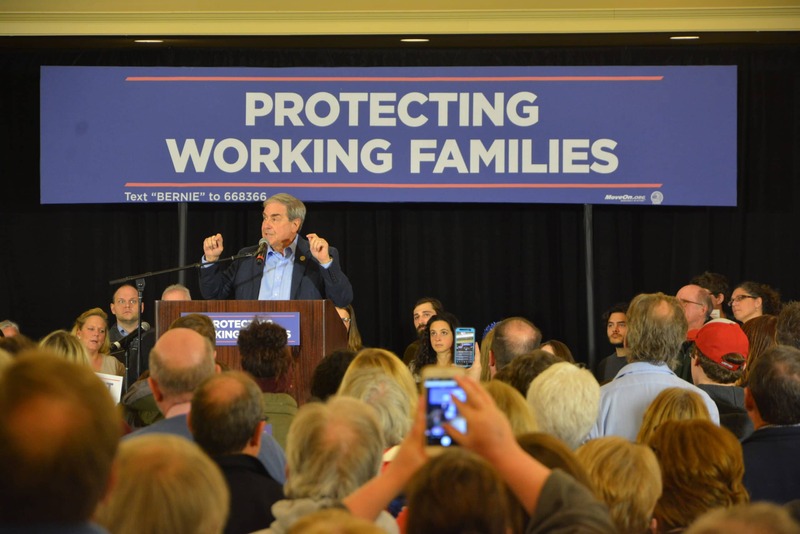 According to Yarmuth, $1.5 trillion could erase all student debt, cover medicare premiums for every senior citizen for 10 years, modernize a third of all public schools or repair every road in America. “The GOP’s plan is not a trickle-down, it’s a trick-down,” Turner said. Turner said giving tax cuts to the wealthy and driving up deficits will lead to the defunding of programs like social security, welfare and Medicaid. “This is not about Democrat or Republican, this is about right and wrong,” Turner said. Some grants for students are being cut and graduate research waivers will also be taxed under the new bill. SGA Services Vice President Christopher Bird was in attendance. Bird said the bill was not tailored for college students and could be disastrous. “The vast majority of students are hard working middle class people, most of whom don’t have a very stable income at the moment,” Bird said. Sanders’ speech from Washington D.C. was projected to more than 100 people. He talked about the Trump administration’s failure to meet many of its campaign promises. He said that the Republican Party was attempting to pass a bill which will send 62 percent of its benefits to the wealthiest one percent of people at a time of massive wealth inequality, and it will increase the budget deficit by more than a trillion dollars. Sanders said these tax breaks will be paid for by the working class. “Eighty-seven million middle class Americans will pay more in taxes by the end of the decade. How does that happen? Well, it happens that the tax cuts in this bill that go to the middle class just coincidentally, no doubt, expire by the end of 2025,” he said. Majority Leader of the Senate Mitch McConnell was confident in the bill’s passage Dec. 1. Upon passage, the differences in the Senate and House versions of the bill mean that it will go to back to a conference for changes. Then it must be voted on again in each house.